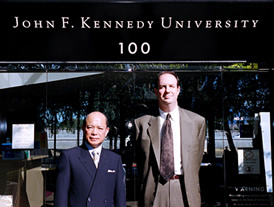 John F. Kennedy University, located in Pleasant Hills in the Bay area in California, honored Dr. Teruhisa Mokuno who is a distinguished visiting research scholar at JFK-U, by designating one of the classes on the campus of the University after his name. 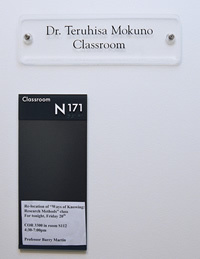 The official ceremony of designation of the class room took place on August 20th this year with the attendance of President Steven Stargardter, PhD, DJ, and Dr. John B. Tsu, a noted member of Regent of the University, Academic Vice Presidents and his colleagues as well as many professional experts engaged in care services for the elderly from the University community. 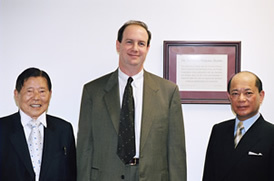 With guidance and assistance of Dr. John B. Tsu and professional groups engaged in the field of gerontology and care services for the elderly, Sun-Life Social & Welfare Organization and Sun-Vision Social & Welfare Organization in Japan of which Dr.Mokuno is acting as CEO, had developed "Elder Workshop Programs" in partnership with John F. Kennedy University ten years ago.. Through this partnership relationship, there have been many activities which provided with the mutual exchange of professional persons both way between Japan and the United States. This partnership relationship provided for professional persons engaged in care services for "Elder Workshop" which has been the on-going programs for the last ten years being participated by JFK faculty members and professional groups in the Bay area. More than 250 professional persons from Japan such as administrator of nursing homes, care givers, PT and OT as well as other professional persons participated annually at this Eldercare Workshop being hosted by JFK-U. 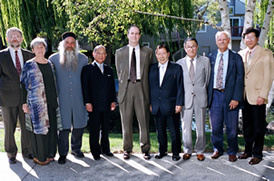 From the U.S. side, many professional persons who are administrator of regional health authorities, registered nurses, clinical psychology counselor and other professional experts in the field of care services for the elderly visited Japan for conducting lectures, symposiums and interactions with their counterparts, which promoted and enhanced the bilateral relationship on health and care services for the elderly. Each year, JFK-U faculty members and its graduates visit Sun-Life & Sun Vision Social Welfare Organizations to conduct specially programmed lectures for the administrators and staff at Dr.Mokuno’ facilities in Japan. It has provided the opportunity of enhancing the mutual understanding and in-sight into how care services for the elderly should be coped in the light of growing aging society crating complex issues as we are being faces with. The issue of aging is no longer the question of how care services for elderly should be enhanced but it will have no doubt inescapable impacts on the shaping of the nation and the world as whole as it could affect on the future picture of our daily life resulting from a predicted demographic changes both among advanced and developing nations. The U.S. Foundation for International Economic Policy is very pleased that we have been a part of this endeavor of promoting and enhancing this important bilateral relationship.